﻿ Portfolio: Corruption, destruction, mutation, and monsters. Most well-known myths: It is said that the world of Aerth was created by the other gods to imprison Goz and bring an end to the Immortal War. Although no longer able to directly interfere with the affairs of the cosmos, the Destroyer’s influence can still felt on Aerth. His foul energies bleed into the world, capable of mutating life, spawning horrid beasts, and bringing blights to the environment. It has been prophesized that if Goz were ever to escape his prison, it would result in the annihilation of Aerth and reignite the Immortal War. Periodically in Aerth’s history, a fiery red comet has appeared in the sky for days or weeks at a time. This comet is known as the Eye of Goz and is believed to herald the coming of a great cataclysmic event. 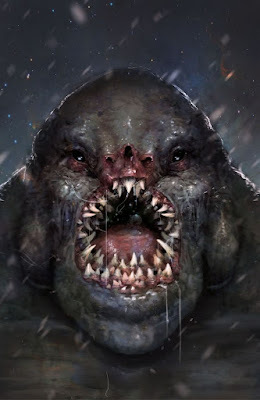 Manifestation: Goz is most commonly symbolized in the form of a gaping, toothy orifice. In paintings, and similar forms of art, he is depicted by an empty or blank space. Rituals: The Destroyer neither demands nor expects offerings, for in the end all things will be consumed – even his own followers. Those insane enough to venerate the god of destruction, however, will periodically pay tribute. This may take the form of animal or human sacrifices, or the razing of buildings and monuments. Reward & Punishment: Goz is an uncaring god. He pays little attention to those that worship him. However, occasionally, his power on Aerth may grace a potentially potent cult or destructive individual. Those so “blessed” have received tremendous strength, given birth to hideous monsters (often killing the mother in the process), or burst into fits of blind destructive rage. Those that offend Goz often receive similar “gifts”, although these quickly result in an even more painful and horrid demise for the recipient.